UofL's commitment to sustainability is reflected in our Green Purchasing Policy. Learn more about The Benefits of Buying Locally! The University of Louisville is committed to the stewardship of the environment and to reducing the University’s dependence on non-renewable energy. UofL's Green Purchasing Policies and Procedures support the University’s commitment to sustainability. The goal of this policy is to reduce the adverse environmental impact of our purchasing decisions by buying goods and services from manufacturers and vendors who share our commitment to the environment. Green purchasing is the method wherein environmental and social considerations are taken with equal weight to the price, availability and performance criteria that colleges and universities use to make purchasing decisions. Green Purchasing is also know as “environmentally preferred purchasing (EPP), green procurement, affirmative procurement, eco-procurement, and environmentally responsible purchasing.” Green Purchasing minimizes negative environmental and social effects through the use of environmentally friendly products. Green Purchasing attempts to identify and reduce environmental impact and to maximize resource efficiency. Learn more with the Sustainable Procurement Toolkit available from the Association for the Advancement of Sustainability in Higher Education (AASHE). All desktop computers, notebooks and monitors purchased must meet, at a minimum, all Electronic Product Environmental Assessment Tool (EPEAT) environmental criteria designated as “required” (silver registration) or higher as contained in the IEEE 1680 Standard for the Environmental Assessment of Personal Computer Products, whenever practicable. Additional consideration will be provided for electronic products that have achieved EPEAT Gold registration. The registration criteria and a list of all registered equipment are provided at http://www.epeat.net/. Copiers and printers purchased shall be compatible with the use of recycled content and remanufactured products. All energy using products purchased by U of L shall meet the U.S. EPA Energy Star* certification when available and practicable. When Energy Star labels are not available, all purchasing units shall choose energy products that are in the upper 25% of energy efficiency as designated by the Federal Energy Management Program. Suppliers of electronic equipment, including but not limited to computers, monitors, printers, and copiers, shall be required to take back equipment for reuse or environmentally safe recycling when deemed appropriate by UofL. Where applicable, energy-efficient equipment shall be purchased with the most up-to-date energy efficiency functions. This includes, but is not limited to, high efficiency space heating systems and high efficiency space cooling equipment. When replacing vehicles, UofL shall consider less-polluting alternatives to diesel such as compressed natural gas, bio-based fuels, hybrids, electric batteries, and fuel cells, as available. When practicable, UofL shall replace inefficient interior lighting with energy efficient equipment. When practicable, UofL shall replace inefficient exterior lighting with energy-efficient equipment. Exterior lighting shall be minimized where possible to avoid unnecessary lighting of architectural and landscape features while providing adequate illumination for safety and accessibility. Purchase only the most water efficient appliances available. This includes, but is not limited to: high performance fixtures like toilets, low-flow faucets and aerators; and upgraded irrigation systems. Cleaning solvents should be biodegradable, phosphate free and citrus-based where their use will not compromise quality of service. Industrial and institutional cleaning products that meet Green Seal certification standards or environmental preferability and performance shall be purchased and/or be required to be supplied by janitorial contractors. Vacuum cleaners that meet the requirements of the Carpet and Rug Institute “Green Label” Testing Program – Vacuum Cleaner Criteria, are capable of capturing 96% of particulates 0.3 microns in size, and operate with a sound level less than 70dBA shall be used by in-house staff and required for janitorial contractors. Whenever possible, products and equipment should not contain lead or mercury. For products that contain lead or mercury, preference should be given to those products with lower quantities of these metals and to vendors with established lead and mercury recovery programs. When maintaining buildings and landscapes, UofL shall manage pest problems through prevention and the use of environmentally friendly products. They may either adopt and implement an organic pest management policy and practices or adopt and implement an Integrated Pest Management (IPM) policy and practices using the least toxic pest control as a last resort. Bio-based plastic products that are biodegradable and compostable, such as bags, film, food and beverage containers, and cutlery, are encouraged whenever practicable. Compostable plastic products purchased shall meet American Society for Testing and Materials (ASTM) standards as found in ASTM D6400-04. Biodegradable plastics used as coatings on paper and other compostable substrates shall meet ASTM D6868-03 standards. Vehicle fuels made from non-wood, plant-based contents such as vegetable oils are encouraged whenever practicable. Paper, paper products and construction products made from non-wood, plant based contents such as agricultural crops and residues are encouraged whenever practicable. Ensure that all wood and wood contained within the products that UofL purchases is certified to be sustainably harvested by a comprehensive, performance based certification system. 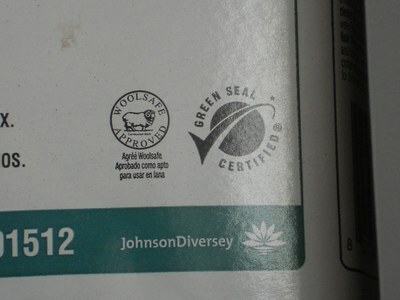 The certification system shall include independent third-party audits, with standards equivalent to, or stricter than, those of the Forest Stewardship Council certification. Purchase or use of previously used or salvaged wood and wood products are encouraged whenever practicable. 30% post-consumer waste recycled paper is the standard for all applications where economic use of paper and quality of service is not compromised or the health and safety of employees prejudiced. All recyclable materials are to be recycled through the UofL recycling program. This includes, but is not limited to: paper, newspaper, cardboard, aluminum cans, plastic bottles and steel. All Toner, Laser and Inkjet cartridges other than those supplied by the University's current contractor for copiers (Xerox), shall be recycled through a contract established with Clover Technologies. See Procedures. When specifying asphalt concrete, aggregate base or Portland cement concrete for road construction projects, recycled, reusable or reground materials shall be used when practicable. Transportation products, including signs, cones, parking stops, delineators, channelizers and barricades shall contain the highest post-consumer content practicable. All documents (by UofL and Suppliers) shall be printed and copied on both sides to reduce the use and purchase of paper, whenever practical. All surplused desktop computers, notebooks and monitors shall be disposed of through one of the following programs: computer recycling program; Connect Kentucky program; or the Signature Partnership Initiative. Packaging that is reusable, recyclable or compostable is preferred, when suitable uses and programs exist and eliminate packaging or use the minimum amount necessary for product protection, to the greatest extent practicable. ecoScorecard can be used to compare the green attributes of products from furniture to flooring and see how each contributes to LEED and other certifications. Green purchasing concepts shall be integrated into architectural designs, final construction documents and into the final construction of all UofL buildings, renovations of property or facilities owned by UofL. All new campus construction as well as large renovation projects will target the U.S. Green Building Council’s LEED Silver standard or equivalent. This policy covers all building types as well as building components. When maintaining buildings, products with the lowest amount of volatile organic compounds (VOCs), highest recycled content, and low or no formaldehyde shall be used when practicable when purchasing materials such as paint, carpeting, adhesives, furniture and casework. All carpet distributors and/or manufacturers of carpet installed at UofL must have a carpet recycling plan that is approved by Purchasing and Department of Environmental Health and Safety. The use of chlorofluorocarbon and halon-containing refrigerants, solvents and other products shall be phased out and new purchases of heating/ventilating/air conditioning, refrigeration, insulation and fire suppression systems shall not contain them. All landscape renovations, construction and maintenance performed by internal staff members or contractors providing landscaping services shall employ sustainable landscape management techniques for design, construction and maintenance whenever possible. This includes, but not limited to, integrated pest management, drip irrigation, composting and use of mulch and compost that give preference to those produced from regionally generated plant debris and/or food waste programs. Landscape structures constructed of recycled content materials are encouraged. The amount of impervious surfaces in the landscape shall be limited, whenever practicable. Permeable substitutes, such as permeable asphalt or pavers, are encouraged for walkways, patios and driveways. Plants should be selected to minimize waste by choosing species for purchase that are appropriate to the microclimate. Native and drought-tolerant plants that require no or minimal watering once established should be purchased. Ordering food for a campus event? Why not use the occasion to highlight delicious, fresh, seasonal, sustainable food from our region? >> UofL Dining's catering service offers great local food options throughout the year, as does Farm To Fork Catering, and many other area caterers. Find Louisville Caterers using local food here. >> Reduce your impact even more and enhance the healthiness of your offerings by requesting low-meat or vegan catering. >> No matter who you hire, just remember to ask for local!...and as few disposable items as possible. No bottled water or styrofoam, please! When purchasing agricultural products, all food contractors shall purchase Kentucky-grown agricultural products if the products are available and if the vendor can meet the applicable quality standards and pricing requirements. All food contractors shall agree to work with their distributors to purchase a minimum of 15% locally grown products. All food contractors shall further agree that the 15% is an initial percentage and that all food contractors will purchase as much local produce and product as possible. All food contractors and University will review the local purchases annually and mutually agree on increases to the percentage where and when possible. As stipulated by KRS Law (45A.520, 45A.525, 45A.530), the University shall, when purchasing goods, supplies, equipment, materials and printing, require a minimum recycled material content for these goods, supplies, equipment, materials and printing. For example, all paper, paper products and office supplies made of paper must contain a minimum recycled content of 50% recovered material and 10% post consumer waste. Vendors will be required to complete and sign a certification of recycled material form. This form is available from the Department of Purchasing. A complete list of all items and their recycled material content requirements is available under the Kentucky Administrative Regulations. The recycled material content shall be established by administration regulations and at a minimum shall be equal to the recycled material content established by the United States Environmental Protection Agency. In Fall 2017, UofL adopted the following policy as reflected in all RFPs: "When applicable the University shall use "Life Cycle Cost Analysis" as an evaluated component of the Best Value Award process. Products (energy/water consumption and building system components) shall be evaluated on, but not limited to, product cost, installation, operation, maintenance, and disposal costs. Vendors shall be required to include any requested Life Cycle Cost information and calculations associated with the use of their products with the submitted bid/proposal. Failure to supply Life Cycle Cost information may deem your response as non-responsive." 385 recycled toner cartridges were purchased in 2016 (88% fewer than in 2015). All purchased toner cartridges are required to be remanufactured if available. 67,280 reams of copy paper with 30% recycled content were purchased in 2016 (a 9.4% decrease in paper usage from 2015). By purchasing recycled-content rather than virgin paper, UofL saved: 749 trees (2 American Football Fields); 74,510 lbs. of waste (3 garbage trucks); 728,100 gallons of water (1 Olympic swimming pool); 688,202 pounds of carbon dioxide (emissions from 105 cars per year); 311 pounds of nitrogen oxides (emissions of one truck driven for 450 days); and 611 MMBTU (energy consumption of 6 households per year)! 14.2% (6,634 items) of all office supplies purchased by UofL departments had a recycled content (a drop of 7.3% from 2015). Over 17,000 different office supplies with 30-100% recycled content are available through our contract. 58% of our "core list" items (945 items) contain recycled content. Paper products (towels, tissue, envelopes, etc) carry a recycled content from 30% to 50%. Carpet from Mohawk meets Carpet and Rug Institute Indoor Air Quality Program and contains a recycled content. 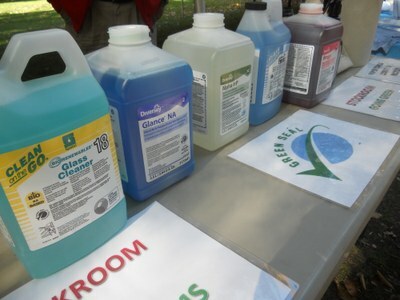 All cleaning chemicals and products used by both UofL Physical Plant and our contract vendors are Green Seal Certified. Other products with a recycled content include: trash can liners, trash cans, microfiber mop heads, brooms, and buffing pads. LED lighting was added to the stockroom in 2015 to replace incandescent bulbs. The 1,171 cartons of recycled paper used by the UofL Print Shop had a recycled content of at least 30% (2.5% less paper used than in 2015). All University outside contracted print vendors are required to use a minimum 30% recycled content in their products. 326,132 pounds of office paper was shredded and recycled (a decrease of 25% from 2015 and equivalent to 1631 trees saved). 13,505 pounds of electronic waste was recycled (a decrease of 83% from 2015). 2,166 printer cartridges were recycled (a 66% decrease from 2015). 2,215,220 pounds of paper, cardboard, plastics, metal, and glass was recycled through our single-stream recycling program (a 15% increase from 2015). New construction and major renovation projects are designed for LEED certification (Leadership in Energy and Environmental Design) from the U.S. Green Building Council. Construction firms are required to recycle all construction waste and stricter requirements are being developed for contractor compliance. All purchases of computer equipment and appliances are required to be Energy Star compliant, and new University purchase practices are being considered for stricter requirements. All materials (furniture and convector units) removed during mold remediation projects at Miller and Threlkeld halls were recycled or donated to Habitat for Humanity. Nothing was sent to the landfill. All new purchases of vehicles other than emergency vehicles and grounds equipment are required to be flex fuel compliant under DOE directive. Sustainable Development is enhanced through sound Environmental, Social and Economic practices and technologies that minimize or eliminate waste and negative impacts on current resources. UofL seeks products and services that pose no significant risk to human health or environmental quality when compared with competing products or services that serve the same purpose. This comparison, where applicable, may consider raw materials and energy acquisition; production and manufacturing; packaging and distribution; and the operation, maintenance, reuse, recyclability or disposal of a product. Materials, products, and workers from the local region are preferred sources, along with companies/contractors that can demonstrate efforts to ensure worker protections and to restore or enhance the environment.